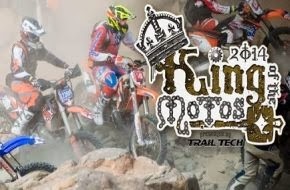 February 2, 2014 (Johnson Valley, CA) – The 2014 King of the Motos Presented by Trail Tech lived up to its reputation as the toughest extreme enduro in the U.S. as 75 riders took the green flag in the third edition of the race. Less than three hours after he raced across the wind-scoured Mojave desert and manhandled his Beta two-stroke up a series of rocky ravines with names like Chocolate Thunder and Wrecking Ball, Cody Webb, 25, from Watsonville, Calif. won his second King of the Motos crown. The all-star field packed the Pro class including former X Games competitors like Kyle Redmond, Corey Graffunder, Colton Haaker and Peter Weiss, in addition to factory KTM rider Taylor Robert, GNCC star Kailub Russell and the legend of extreme enduro riding himself, Graham Jarvis from the UK. Jarvis, who won the inaugural KOM in 2012, has made the voyage across the pond to compete in KOM every year. Despite being tangled up during the afternoon’s mass start, Jarvis, a three-time Hell’s Gate winner and 2013 Erzberg winner, still managed to pick off riders in the technical sections of the course before finding his way to the podium in 3rd. Sandwiched between Webb and Jarvis in second was Taylor Robert, an emerging star in world of endurocross. Robert rode a 300cc two-stroke during the race, the bike of choice among most riders because of its speed in the desert and maneuverability in the rocks. King of the Motos Presented by Trail Tech was divided into three classes – Pro, Sportsman and (two person) Teams. Riding for Dirt Rider, Michael Allen won the sportsman class. In 2013, Allen registered as a pro, but joked onstage that after he got last place, he decided to demote himself. Steven Foord and Michael Salsman won the team category and both were riding trials bikes. While Foord and Salsman won the category, it was the “Flying Hawaiians” Robert Madden and Nathan Brown that were crowd favorites as they returned to KOM to defend their 2013 win. The uncle and nephew team, who were also riding trials bikes, and dressed in their signature Hawaiian shirts. Racing for the unofficial crown of “Queen of the Motos,” Louise Forsely, Morgan Tanke and Ruth Gutish put in respectable efforts. While Gutish DNF’d the morning race, both Tanke and Forsely timed out during the afternoon competition. Forsely, an X Games medalist and trials champion who competed in the 2013 King of the Motos commented that this year’s course was much more difficult than the previous year. Perhaps the most prestigious honor of the day, though, went to Steve Behunin. Behunin was given the first annual Kurt Caselli Sportsmanship Award for his efforts helping other riders throughout the day. There were numerous times during the brutal start that Steve would get off his bike to assist other riders who were struggling. Caselli, a well-loved rider in the role model in motocross community, was killed in 2013 Baja 1000. As the popularity of KOM continues to grow, so does the crowd who follows it. On Sunday afternoon, while the Broncos battled the Seahawks, the sea of RVs in Hammertown spread across the desert and people from across the globe were glued to their computer screens watching the live webcast. More than 35,000 people total are expected to fill the makeshift city during the King of the Motos/King of the Hammers week-long event which concludes Friday, Feb. 7th with the main event – Griffin King of the Hammers Presented by Nitto.